Macranger says it’s like Comparing Godzilla to an Ant. 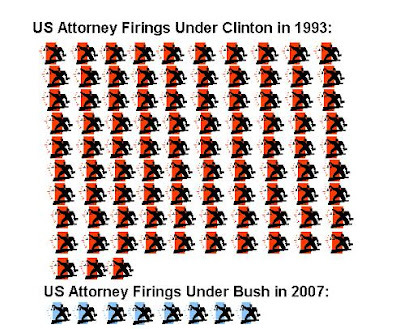 But this didn’t stop the media from coming up with ridiculous arguments against President Bush and how his legal and willful firings of US Attorneys was somehow more serious than when Clinton came in and wiped the slate clean in 1993 to block an investigation of a crucial Clinton ally, Daniel D. Rostenkowski. He was later indicted on 17 counts of embezzling public and campaign funds, mail and wire fraud, conspiracy, and obstruction of justice. Rostenkowski was sent to prison anyway. Clinton pardoned his criminal friend before he left office. President Bush said on Wednesday that he was “frankly not happy” about the way Attorney General Alberto Gonzales had handled the dismissal of federal prosecutors but that he still had confidence in Gonzalez. Patterico describes how this will backfire on the democrats.